Tabata Basic: Tabata, always a strong dose of medicine. I once saw a film where one of the characters described The Theory of Relativity as “When your talking to a pretty girl, an hour seems like a few seconds, and when holding a burning hot skillet a few seconds seems like an hour”. Funny how that 10 seconds of rest just gets shorter and shorter. 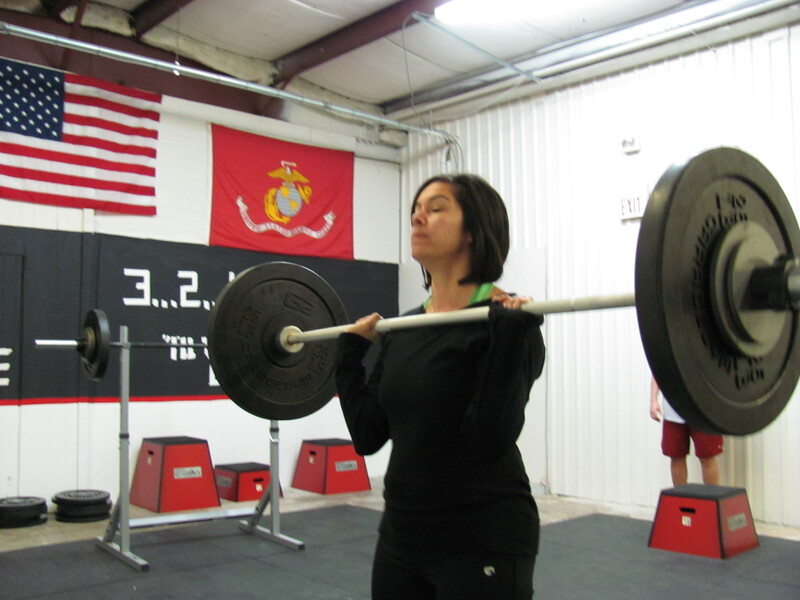 Effort follows focus: Christina seconds before setting a new PR on Push Press, one of three PR's that morning!!! I am so sorry I slept in and missed this one……………not really. Hope you guys had fun! The best part of this morning was finishing the WOD, coming home, taking a hot shower, and crawling back into bed. greetings from st louis where Jessica and I are working out at a very nice, well-appointed gym (not crossfit!) that has way too much expensive, pretty but completely non-functional gear (nary a barbell, kettlebell, or wallball in sight). I miss CFSB. so we’re making do with what we can. Today was “cindy” – AMRAP in 20 mins of 5 pullups, 10 pushups and 15 squats. 13 was the result (not a PR, but didn’t have Matt’s encouragement to keep me going). Got a lot of strange looks from the locals. Yesterday I took my 17 year old nephew and Jess and introduced them to a 4:00 warm up of renegage man makers (introduced myself to them as well). Then did 400m sprints interspersed with 20 pullups, 40 pushups, 60 squats and 80 situps. Again, the folks on the abductor thingy and elliipticals gave us the arched eyebrows. I ran, I push pressed (70#-new pr), then tabata’ed. It was frustrating to get 4 rounds at a higher number then in 6 of 8 rounds my number fell like a rock. 28 total (5 assisted push ups, 7 sit ups, 7 box jumps and 9 squats). Then I went to work. Have you ever tried to hold a needle still to draw blood from a patient after doing at least a minimum of 40 push ups? Needless to say they kept me in the back and on the machines. Just kidding. We are missing you this week. Enjoy your family, have a safe trip and come back ready to get some………..